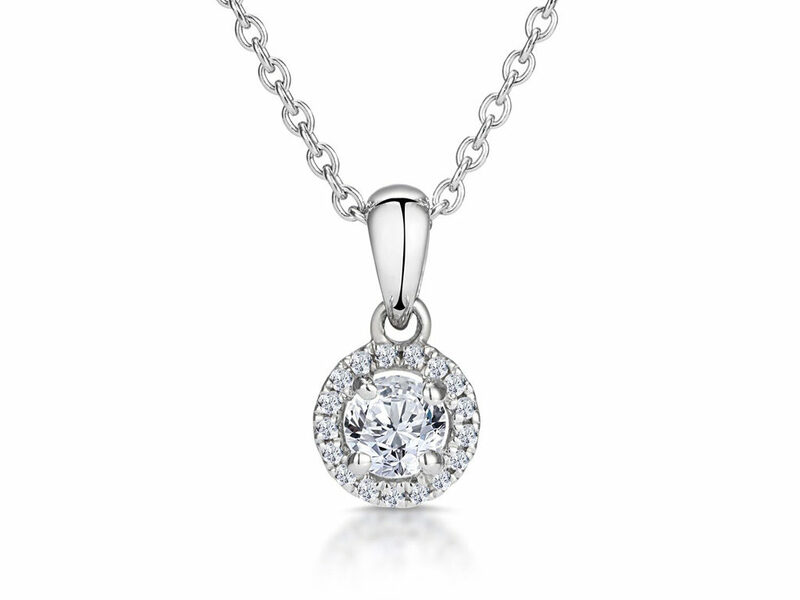 A beautiful diamond necklace containing a round cut diamond and halo. This is a necklace that makes the most out of your diamonds. By having the centre stone surrounded by a ring of smaller diamonds (also known as a halo), it gives an illusion of a bigger diamond. The necklace is all tied together in a stunning platinum fine chain and set in a four prong setting. Similar to the previous one, this necklace contains a magnificent round cut diamond. The diamond is held securely in a four prong setting and finished with a platinum fine chain. A more regal look, this necklace features a princess cut diamond in a four prong setting. The diamond looks most striking when seen from above, which makes it perfect for a necklace. Matched with the delicate fine platinum chain and this is a great gift for those looking for an elegant addition to their jewellery box. This necklace is perfect for those looking for something a little different from the more traditional round cut diamonds. The centre diamond is surrounded by a platinum band, acting as a frame and drawing attention to the diamond. This is also one of the most secure settings as the diamond is covered around the sides compared to the prong settings. Those are just some of the many styles we offer at Hatton Garden Diamonds. If you like any of the styles shown or have questions on any aspects of diamonds then don’t hesitate to get in touch. We can be reached via the contact form or by telephone. Alternatively, you can pop into one of our stores in Hatton Garden where we have knowledgeable and friendly staff who will answer any enquires you may have. This entry was posted in Necklaces & Pendants. Bookmark the permalink.